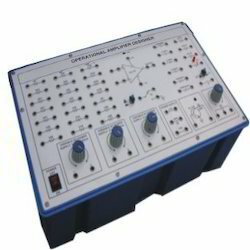 Prominent & Leading Manufacturer from Jaipur, we offer analogue lab, led radiation pattern trainer kit and operational amplifier designer. Owing to our modernized infrastructural unit, we are instrumental in offering Analogue Lab which is comes with detailed operating instructions, we design this analogue lab using precise grade components and leading technologies in adherence with the set quality norms. Our offered analogue lab is commended due to its performance & quality. The analogue lab offered by us can be availed by our customers at market prices. Trainer is designed to learn the LED characteristic (Input LED angle vs.output voltage). LED is a commonly used semiconductor device that emits incoherent narrow spectrum light. LED plays a very important role in todays industrial and domestic applications. In VE-1818 we use three LEDs (Red, Blue and Green) . The characteristic is widely used in various transmitting and receiving scheme and datacommunication.VE-1818 trainer is a self contained experiment module which comes with detailed manual and required accessories. Packaging Details: for any other query feel free to contact us or write to us. "OP-AMP DESIGNER" has been designed specifically for the study of OP-AMP IC and its applications. 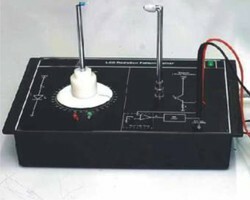 This training board covers nearly all possible applications of operational amplifiers IC and makes the student familiar with the fundamentals of OP-AMPS, their characteristics and applications in various fields.100 experiments can be performed by this OP-AMP desig nen Practical experience on this board carries great educative value for Science and Engineering Students.